The entrance to the Tourist Office, Place de la Station (next to Starbuck’s café). In the morning we shall be visiting the “Musée des Arts Anciens du Namurois”. It was founded in 1964, in collaboration with the Société Archéologique de Namur and is located in the historical Hôtel de Gaiffier d’Hestroy. The collection in the museum contains internationally renowned historical artworks from the Namur region, including the Art Treasury of the Monastery of Oignies (13th century) and the collection of paintings by ‘Herri met de Bles’ (‘Henry with the Blaze’ also known as Henri Blès), a northern renaissance and mannerist landscape painter, native of Bouvigne. Afterwards we will take a look at the church of “Saint Loup”, considered one of the jewels of the Baroque art in the former Southern Netherlands. It was built between 1621 and 1645 by the architect and Jesuit brother Pieter Huyssens who also designed the St. Carolus Borromeus Church in Antwerp and the St. Walburga Church in Bruges. We end the morning with a short walk in the historic heart of Namur. After lunch, we head to the Rue Notre Dame (behind the Walloon Parliament) where a shuttle train will take us up to the Citadel for a guided tour. 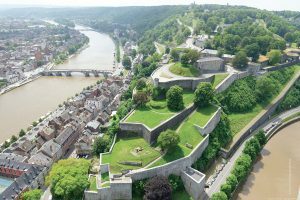 The Citadel of Namur, settled 100 m above the confluence of the rivers Meuse and Sambre, is one of the greatest fortifications in Europe. We will visit the information centre “Terra Nova”, housed in the ancient barracks, where 2000 years of military and urban history are displayed in a dynamic and educational mise-en-scène around Namur and its Citadel. Afterwards we will go down into the huge underground tunnel system, ‘The Termite Mound of Europe’ as Napoleon once called it. After our visit the shuttle will bring us down again. However, those brave enough can always do the descent on foot.